Did you know that Occupational therapy practitioners are the only health care professionals who use a client/environment/occupation perspective that considers the interface between these three elements when assessing and recommending complex equipment? OT practitioners bring in-depth knowledge of occupational performance and participation, and they provide expertise in human function; human development; and the impact of physical, behavioral, social, and cognitive changes throughout the lifespan. This course provides an overview of the evaluation process for complex rehabilitation technology highlighting the distinct role of our profession. Discussion includes our position on the team, our role in education and the use of AOTA recommended client focused assessment tools. 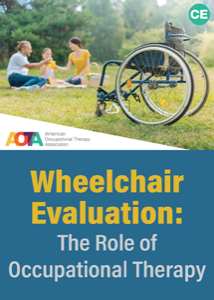 · Describe the role occupational therapy practitioners during the wheelchair evaluation process. · Discuss the use of a specialized seating and mobility evaluation method used by the therapist to assess client’s physical and functional needs in relation to wheelchair and seating procurement. · Identify the correlation of body measurements to product choices. · Describe how environmental assessment informs wheelchair selection and customization. · Describe how proper positioning and alignment impact sitting posture and function.